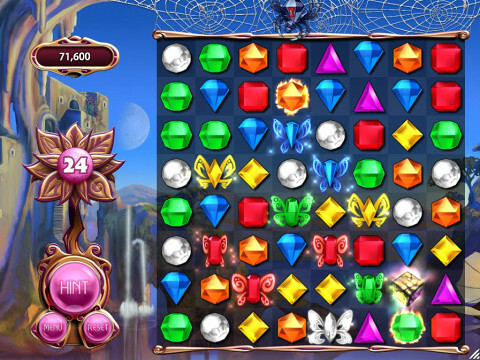 Bejeweled has been the face of casual games for a long time, much less of the “match 3″ subgenre. It and its imitators can be found everywhere, from Puzzle Quest to World of Warcraft mini-apps. One of the challenges of a Bejeweled 3 is that there is very little to the formula you can actually add or change. Bejeweled Twist managed to add some life by adding a new selection mechanic, but otherwise, a vanilla sequel would need much more. Bejeweled 3 accomplishes this by adding fresh new game modes. Of course, it includes the base game, in which you match 3 gems to score. Four gems matched creates an explosive Flame gem. 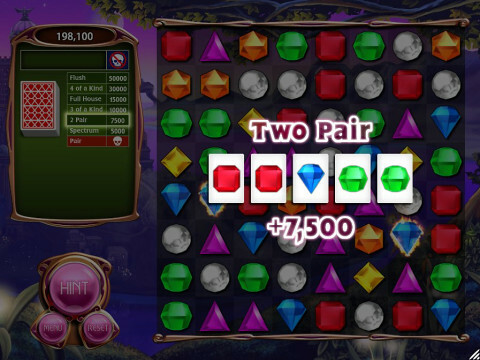 Matching five gems creates the Hypercube which can be matched with another gem to eliminate all gems of that color. Two holdovers from Bejeweled Twist can be found in 3: the Star gem and the Supernova gem. The Star gem is created when a T or L shape is matched with gems – when ignited, the Star gem shoots lasers in four directions and destroys the gems in their paths. The Supernova gem is even more difficult to create: matching six or more gems in a row, which can only be done in a complicated string of explosions. When a Supernova gem explodes, it does the same as the Star gem, only with three rows in four directions. The game ends when there’s no more matches to be made. One of the new twists is that if two Hypercubes are matched, they remove all of the gems from the board, save themselves. That’s fine, but a slight rehash of Bejeweled 2 isn’t enough to justify a sequel. That’s why Bejeweled 3 comes with a bunch of variations of the concept. The most entertaining of these new game modes is Poker, in which you match gems to create poker hands, such as pairs, spectrums (one of each type of gem), two pairs, three of a kind, full houses, four of a kind, and flushes. As you play, the game begins to restrict the types of hands you may achieve, starting with pairs. Creating hands will make those low types of hands available. Should you, say, make a pair when a pair is restricted, the game flips a coin, giving you a 50-50 percent chance of “game over”. The other exciting new game mode is Diamond Mine, in which you use gems to blast away rock and uncover artifacts and precious rocks like diamonds and crystals in 90 seconds. Clearing all but the bottom two rows extends the gameplay by 30 seconds, and digs deeper into the earth. Matching two Hypercubes or somehow clearing the board in another way will give an extra 90 seconds. The game mode is somehow deeply exciting with a “one more try feel”. Butterflies is a cute game mode in which there are gem butterflies that float up one square after every turn. At the top of the board is a hungry spider, and should a butterfly be eaten by the spider, the game is over. The fourth main game mode is Ice Storm, in which columns of ice slowly freeze the board. The ice can only be removed with matches – vertical matches completely destroy the ice columns. This mode is a tough blitz mode because aside from having to identify matches quickly, the player has to have good concentration because it does everything it can to distract you. The Puzzle mode basically challenges players with objectives for the other game modes like Poker or Butterflies, as well as some mini-modes such as Alchemy (a nod to the popular Popcap game of the same name that was usually bundled with Bejeweled) in which you had to cover the entire board with gold in a limited amount of time; Balance, a strange game in which you have to earn blue and red gems evenly lest one color tip the scales over; Sandstorm, in which you have to uncover archeological treasures before sand recovers them; Time Bomb, which is a nod to Bejeweled Twist in which bombs appear and the player has to detonate them before they go off by themselves; Stratamax, in which one must remove a certain number of gems in a certain number of moves; and Wall Blast, in which the player has to remove a wall in a limited number of moves. The only real complaint is that these games don’t have an “infinite” mode – once you solve all the puzzles, there’s little point into replaying them. It would have been nice if, say, Stratamax Infinite challenged the player to see how many gems they could remove in 90 seconds. There is, of course, a Zen mode which is a neverending game of Bejeweled 3 which basically serves as either a relaxation mode or experimental mode for advanced players who want to try out tricks to see how they might get the elusive Supernova gems in the regular mode. Overall, Bejeweled 3 is a warm welcome from an old friend who wants to show you that an old game can learn new tricks. This game is definitely a keeper, and a welcome update to the long-running casual game series. It’s well worth the wait. Dragon Age III Won’t Have Mods? !